Received USN pilots wings at Connally AFB, Waco, Texas, 1953. Served as a fighter pilot with the USAF in the US and Germany until 1958. Graduated from the USAF Experimental Test Pilot School at Edwards AFB, California in 1959, remaining there as an instructor until selection by NASA in 1962. Assigned to communications, instrumentation and range integration for Project Gemini when selected by NASA. 1965, Pilot of Gemini 6A, the first mission to rendezvous with another manned space craft. 1966, Command Pilot of Gemini 9A in advanced rendezvous maneuvers with the Augmented Target Docking Adaptor(ATDA). August 1966 to October 1968, head of mission planning analysis and software development for Project Apollo. 1969, CDR of Apollo 10, the dress rehearsal for the first manned lunar landing. 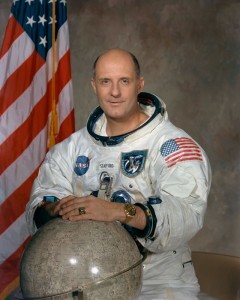 Following the mission, Stafford was named Acting Chief of the Astronaut Office, replacing Al Shepard while he trained for Apollo 14. 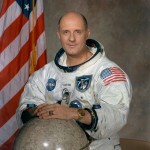 1971, Named Deputy Director of Flight Crew Operations, assissting Deke Slayton. 1975, CDR of the Apollo-Soyuz Test Project, the first joint space mission with the Soviets. Retired from NASA in November of 1975 to become the Commandant of the USAF Flight Test Center receiving a promotion to Major General. 1978, Promoted to Lieutenant General and named Deputy Chief of Staff, Research, Development and Acquisition at USAF HQ, Washington, D.C.
1979, retired from the USAF to co-found the technical consulting firm of Stafford, Burke & Hecker Inc., in Alexandria, Virginia. Member of the Board of Directors of six different corporations. Served as a consultant to the President in various capacities and to NASA for the co-ordination of Shuttle-Mir activities in the early to mid 1990’s.